Home » Bollywood News » After seeing Deepika Padukone's beautiful picture, hubby Ranveer Singh has something special to say! After seeing Deepika Padukone's beautiful picture, hubby Ranveer Singh has something special to say! Deepika Padukone and Ranveer Singh are giving major love goals to all couples around the world. When it comes to Deepika, Ranveer singh becomes a drooling husband to her, he never fails to shower his love on her whether it’s in a person or on a social media. He is constantly encouraging and loving Deepika. 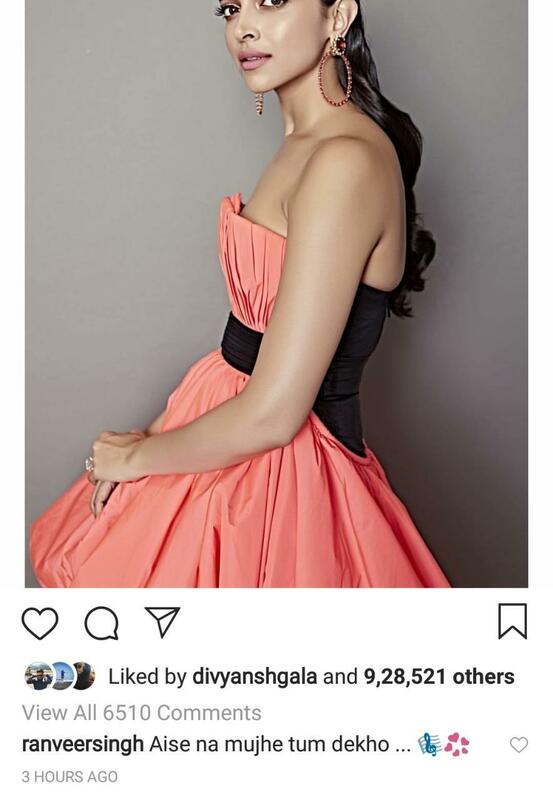 Recently, Deepika posted her pictures on her instagram from recently held award show in which Deepika graced the look beautifully.While Ranveer missed the event, so he made sure to mark his presence by showering his love on her lady by commenting on her post. As Deepika took it to her social media handle to share a lookbook from the night, he wrote, 'aise na mujhe tum dekho'. Well, we wonder does Ranveer hums this song to her loving lady, but this doesn’t ends here, take a look on another picture of Deepika Padukone’s post from the same event. We are in awe of this couple who never fails to give us serious love and wedding goald to people out there. They have lived the dreamy romance and with marriage have proved that dreamy romance is not dreamy anymore.